Especially in North Florida, the Panhandle, Alabama, Georgia, Mississippi and Louisiana. If you are from one of these areas please help spread the word about our program and how people in these states can order their own air potato beetles. We have press releases, newsletter and newspaper articles to share, so no matter where you live we are happy to provide materials to anyone who wants to help promote the program in their community. Last summer we had a photo contest (you can see the details Here and our winners Here). Everyone had fun, we gave away some prizes, so we are going to do it again in August! The details are still being worked out, but this year the prizes will include custom designed Air Potato Patrol T-shirts. So watch your e-mail for more details! If you would like to order air potato beetles for your property, here is a Link to the order form. Just print, fill out the form and mail it in to receive a free order of beetles. Prior to the delivery of this season’s beetles, I noticed considerable beetle activity in the potato vine. So we must have had good wintering over here in Sarasota County. That’s great- early season damage should mean that your beetles overwintered on your property well. Rampant vines in my Sarasota yard, but “my” beetles are not back. There are some across the street. Hope they come over for a feast. They probably will- the beetles fly very well and spread quickly once their numbers build up. I’m so excited to see activity in the Wekiva area of Longwood, Florida. Irma really hurt activity last year. Hopefully, we’ll see more activity. They are certainly getting very busy. Lots of beetles enjoying their morning in Hernando County. That’s how you get more of them!!! I’m getting good action on an area where I have lots of vines and prior/new release of beetles. I’m pleased with that. However, I have a small area about 100 feet away from my main area that has some vines. There was some beetle action a couple weeks ago — but now nothing. Hopefully, we’ll see more beetles emerge soon. Beetles are very busy skeletonizing my vines!! Vines are showing up in areas of my acre of Sarasota County where they have not been before, but the beetles are finding them.!! They’ll do that. The beetles will spread from one spot to another long before their food supply is gone. I filled out a form but never received the beetles? Hi Marlene, I sent you an e-mail for more info. I’ll check on it for you. beetles returned on their own. I did have to relocate some to places on my property that had none. The population is growing now. *June 28, 2018 – current beetle shipment is showing signs of activity and expansion! *May, 2018 – after and unusual 4 day subtropical rain event, new vine growth resumed with no beetle activity. I attribute this to the pea size bulbils from previous seasons ability to regenerate from leaf debris. *Sept. 2017 – active beetle activity ceased after Hurricane Irma. We experienced extensive wind damage with many downed trees and plant damage. *Oct. 2017 – I surmised that the beetles had been blown north after seeing hurricane damage while driving through central Georgia – your July 2018 update confirmed this. *June 2017 – beetle shipment/activity successful. Lots of air potato vines in my observation spot. Looks like a lot of beetle activity, but they have a big job to do. Glad to hear they’re back. Once the population starts to build you should notice much more damage. 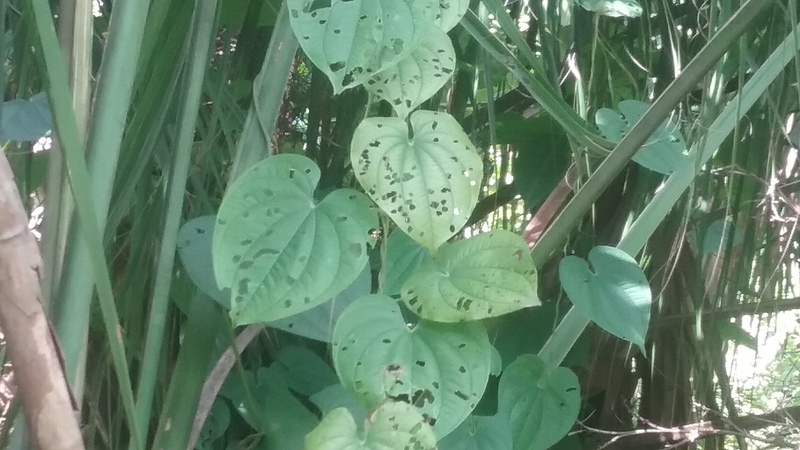 I’m noticing much more munching and holes in all my air potato vines on my 5 acres in Lake Sarasota. When will map be updated? We’re working on updating the map! The site I started in Manatee County was slow to see activity of the Beetles this spring. This may be a result as discussed in the Website of the beetles did such a good job last year that they moved on after over wintering to other sites, and it took time for beetles to move back in. In review the site today, there is activity now. How ever in discussion with others familiar to the site, a question came up regarding the hurricane last year. Is there any documentation or discussion regarding the impact of the hurricane on the beetles and there ability to feed, or populations, this year? The immature and adult beetles can eat any time of day and hide among the foliage. When the adults are disturbed they drop to the ground and play dead- which can make them difficult to catch! It is true that the beetles will not kill the vines- they can greatly reduce photosynthesis and bulbil (potato) production. To totally eradicate the vines you would have to physically remove the plants and all of their roots. The beetles can reduce the vines to a tolerable level and slow their spread. We live in Deland Volusia County. This year the beetles have been doing a very good job of skeletonizing the leaves on the vines. Thank you for sending them to us…..
That’s great- glad to hear they’re working for you! As of July 19 (2018) I’ve seen small signs of activity since early June but progress has been slow. I haven’t released any new beetles this year. Should I order more or wait until they become more active. I’m in Hillsborough County near the Polk County line. You could order more, but they may take a while to arrive. It never hurts to send in an order. Noticed beetles for the first time this year in northern Palm Beach County. Looks like they’ve been active for a week or so but been watching regularly… See lots of larvae and adults! I am seeing no activity in my area. Last year I had a lot of beetles. and the vines were heavily eaten. I was getting worried the beetles were gone and my infestation of air vines was back. But after much encouragement to be patient and info from Mr. Kerr I am happy to say they are back and doing their thing!! Thks again Mr. Kerr!! I haven’t seen any beetles yet. Last year I would see them frequently. 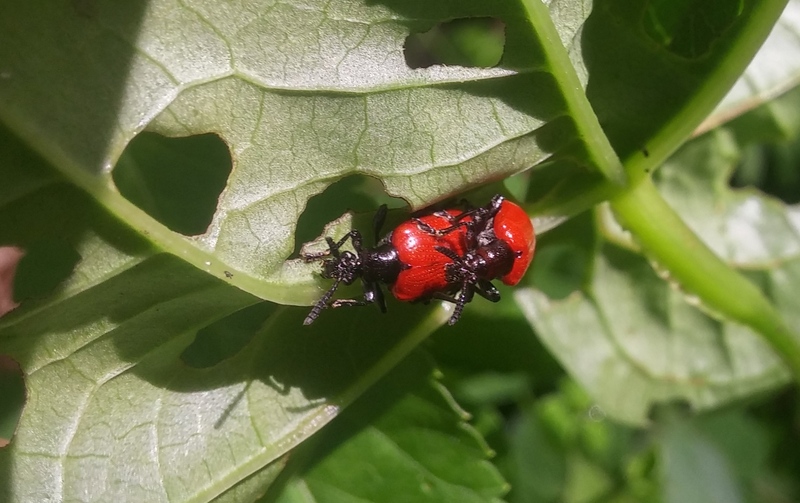 However, the beetles are now getting very busy eating the leaves and may just eradicate them before they start setting the “potatoes.” I am in the Forest Hills area of Hillsborough County.